Show customers your most popular or helpful content first by prioritising the order of your categories. 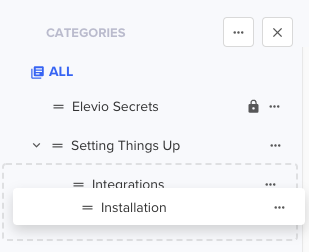 The order of categories on display in the assistant will mirror the order of display of categories in your Content Management area. To reorder categories, simply click on the menu button in the "Categories" section and select "Reorder". Select a category, drag it above or below other categories and release your mouse click. N.B. You cannot drag an existing category's subcategory into another category. You also cannot drag and drop a top level category to be a subcategory of another top level category. 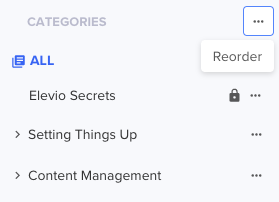 Learn more about editing categories here to modify a category's parent category.